See all DVDs This film takes place at an adventurous elementary school. Among the elementary school faculty is the sleazy principal (Prickly), the tough playground guard (Finster), and the nice 4th grade teacher (Grotkey). 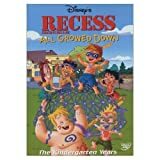 The six main cast members are T.J.,the leader and schemer of the group; Spinelli, the girl who is a bully with a heart of gold; Vince, the playground jock; Gretchen, the science whiz and smartest girl in school; Mikey, the poetic drama king; and Gus, the wimp with a military family. Then there are plenty of other typical elementary school kids, like the spy Randall, the 4 Ashley snobs, the diggers, the kindergardeners, etc., and including the older kids like King Bob. Everyday the group hangs out at recess dealing with different problems they must work together to overcome. 125 6x01 Terrifying Tales of Recess RE065 |edit 2001-08-21 Discuss episode! 126 6x02 Kurst the Not So Bad |edit 2001-11-04 Discuss episode! 127 6x03 League of Randalls |edit 2001-11-04 Discuss episode! 128 6x04 Mundy, Mundy |edit 2001-11-04 Discuss episode! 129 6x05 Lost Leader |edit 2001-11-04 Discuss episode! 130 6x10 The Pale Kids |edit 2001-01-01 Discuss episode!